PT Indofood CBP Sukses Makmur Tbk Noodles Division - Indofood CBP Noodles Divison is the largest instant noodles producers in the world. Indoofood CBP Noodles Division has installed total production capacity of over 18 billion packs per year. Indoofood CBP Noodles Division is a instant noodles division unit of PT Indofood CBP Sukses Makmur Tbk (ICBP Group). ICBP Group or known as "Indofood CBP" is the top leader of consumer branded packaged-food company in Indonesia. 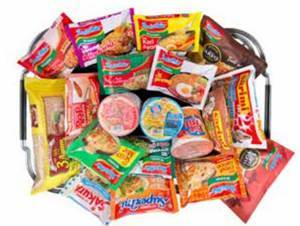 Indofood CBP Noodles Divison running business in producing and selling a wide range of instant noodles products which include instant bag and cup noodles, egg noodles and instant vermicelli. Its key brands are Indomie, Supermie, Sarimi, Pop Mie, Mie Telur Cap 3 Dara, and Pop Bihun. Based in Jakarta, Indofood CBP Noodles Divison now has 17 domestic noodles production facilities and 1 overseas noodles production facility at Malaysia. In term of financial performance, Indofood CBP Noodles Divison has recorded a significant growth and satisfactory performance in the business year of 2017. According to information found in PT Indofood CBP Sukses Makmur Tbk Annual Report 2017 as cited by JobsCDC.com, Indofood CBP Noodles Divison registered a 2.5% growth in total sales value of Rp23.11 trillion as compared with Rp22.54 trillion in 2016. Indofood CBP Noodles Divison contributed 63.7% to the consolidated net sales of PT Indofood CBP Sukses Makmur Tbk in 2017. Referring to its annual report, total consolidated net sales of PT Indofood CBP Sukses Makmur Tbk in 2017 amounted to Rp35.61 trillion. Maximum age of 25 years old per May 2019. Bachelor degree (S1) with minimum GPA of 3.10, majoring in Psychology, Industrial Engineering, Law, Human Resource Management. Bachelor degree (S1) with minimum GPA of 3.10, majoring in Accounting. Bachelor degree (S1) with minimum GPA of 3.10, majoring in any field. JobsCDC.com now available on android device. Download now on Google Play here. Please be aware of recruitment fraud. The entire stage of this selection process is free of charge. PT Indofood CBP Sukses Makmur Tbk - Fresh Graduate I FUEL Program Noodles Division Indofood Group April 2019 will never ask for fees or upfront payments for any purposes during the recruitment process such as transportation and accommodation.